The title character, a hybrid of a youkai-dog and a human, a half-demon ("han'yo" in Japanese). He wields the Tessaiga (pronounced "Tetsaiga" in the American dub), a supernatural sword made from one of his deceased father's fangs. This sword, when properly wielded, can destroy one hundred demons with a single swing, and has further powers which are revealed as the story progresses. 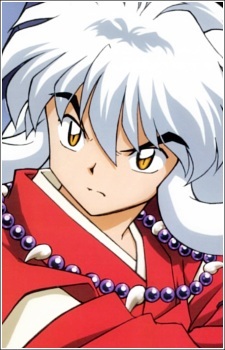 It is also a source of which hatred exists between Inuyasha and his brother Sesshomaru, a full youkai dog demon, being that Inuyasha can wield the Tessaiga and Sesshomaru can not. Inuyasha has a tendency for massive regeneration and can recover from injuries which would be fatal for any average human. This ability is likely derived from his youkai powers (Example: Episode 5, when Kagome brings medicine from her time). On the night of the new moon each month, Inuyasha will change into a normal human with black hair, brown eyes, and loses his yokai power during this time. Prior to meeting his current companions, he would conceal himself during this time. Inuyasha loves Kikyo, and still does, but things get complicated when he starts to develop feelings of love for Kagome. He has mastered different abilities for his sword including the red tessaiga that can destroy barriers and also learning the backlash wave which hurls an opponents demonic energy right back at it.